It’s raining as I type this in late March. So technically these are not April showers, but rain in April is inevitable (at least here in southern Wisconsin), hence the title of this week’s blog post. I have been thinking more about water and rain since I recently watched the PBS documentary “Never Curse the Rain” about Wisconsin author Jerry Apps. In it, Jerry shares his memories of the importance of water in rural life. If you haven’t seen it, I’d highly recommend taking the time to be transported to an earlier time here in the Midwest. Jerry has a unique way with words and storytelling, and really sheds a lot of light on what it was like for a family farm to depend on water decades ago. When I think of April showers, my mind usually travels back to childhood when I enjoyed rain a lot more. In this stage of my life, getting soaked by rain has become more of an annoyance, but this year I have been trying to slow down and enjoy things more. Not a New Year’s Resolution, mind you, but more of a day to day goal. Jumping in mud puddles – the old farm house where we lived until I was eight had a long gravel driveway with a really low spot right about in the middle. In the spring it would get rutted and was a perfect place for me to jump into puddles when the bus dropped me off after school. Mom always knew without asking why my shoes were wet! Getting nightcrawlers after a good rain – It was harder due to the slick ground, so we’d often have to go barefoot. A few times we’d wind up on our butts in the mud trying to grab a big crawler, but man it was fun! Fishing in the rain – If I had a dollar for every time I found myself alongside a stream early season trout fishing in the rain, well, I’d have a lot of dollars. Cold, wet, usually no fish – but also just a lot of fun! Mock spring training in someone’s yard – Yeah, April in Wisconsin can be pretty dicey when it comes to outdoor baseball. In an attempt to get ready for summer Little League, a lot of us youngsters started practicing early. Let me tell you, there’s nothing like standing under a fly ball with the rain coming down on your face waiting to catch the ball. Riding your bike in the rain – Another outdoor activity we sometimes did too early. One time I was riding my bike to a friend’s house in early April, and it lightly snowed on the way there. On the way back it warmed up enough to rain – but it wasn’t a warm rain to say the least! The likelihood of me doing any of these activities these days is pretty low. As I said though, I’m trying to slow things down a bit. So if I’m caught in April showers I’m going to enjoy it more, and remember that these showers give way to May flowers. And in May, perhaps we can all stop and smell the roses. Oh my…where do I begin? 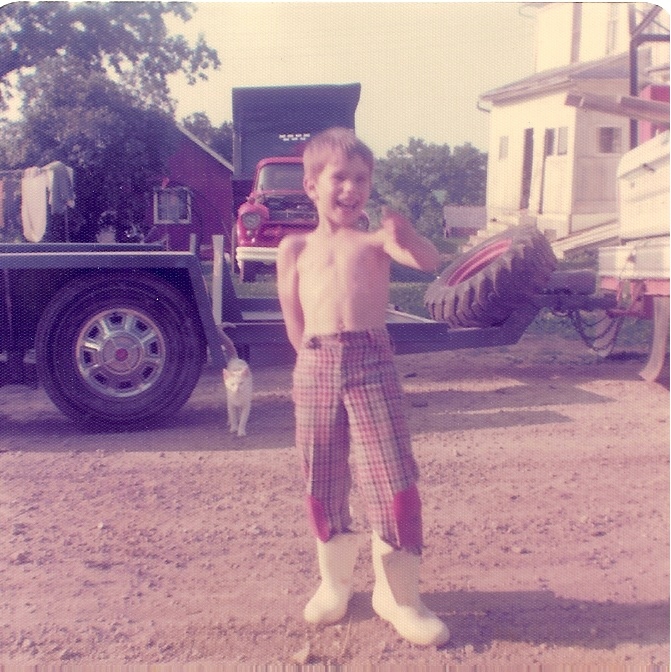 With those bright white rubber boots. I’m in search of a puddle on dry land. 70’s pants. Morris the cat. I was livin’ large.